Virtual local area network, virtual LAN or VLAN is a concept of partitioning a physical network, so that distinct broadcast domains are created. This is usually achieved on switch or router devices. Simpler devices only support partitioning on a port level (if at all), so sharing VLANs across devices requires running dedicated cabling for each VLAN. More sophisticated devices can mark packets through tagging, so that a single interconnect (trunk) may be used to transport data for various VLANs. Grouping hosts with a common set of requirements regardless of their physical location by VLAN can greatly simplify network design. A VLAN has the same attributes as a physical local area network (LAN), but it allows for end stations to be grouped together more easily even if they are not on the same network switch. VLAN membership can be configured through software instead of physically relocating devices or connections. Most enterprise-level networks today use the concept of virtual LANs. Without VLANs, a switch considers all interfaces on the switch to be in the same broadcast domain. To physically replicate the functions of a VLAN would require a separate, parallel collection of network cables and equipment separate from the primary network. However, unlike physically separate networks, VLANs share bandwidth, so VLAN trunks may require aggregated links and/or quality of service priorization. A VLAN is a switched network that is logically segmented by functions, project teams, or applications without regard to the physical location of users. For example, several end stations might be grouped as a department, such as engineering or accounting. When the end stations are physically located close to one another, you can group them into a LAN segment. If any of the end stations are in different buildings (not the same physical LAN segment), you can then group them into a VLAN. You can assign each switch port to a VLAN. Ports in a VLAN share broadcast traffic. Ports that do not belong to that VLAN do not share the broadcast traffic. 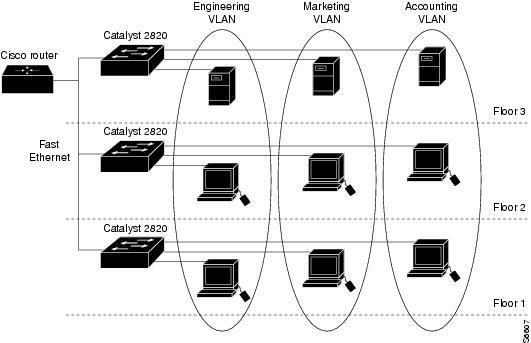 Ports from multiple Catalyst 2820 and Catalyst 1900 switches can be members of the same VLAN. shows an example of VLANs that span multiple switches and multiple floors or a building.